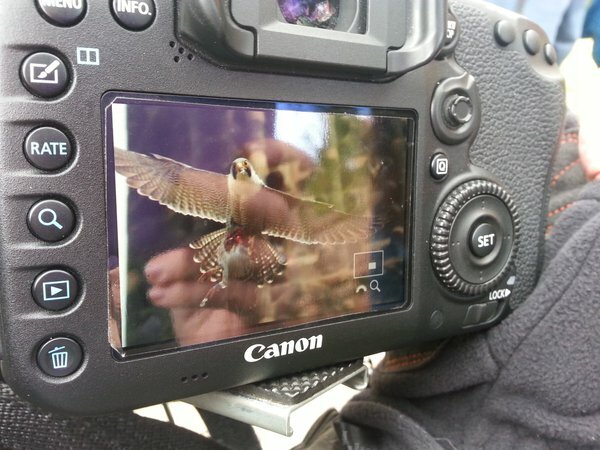 I thought it would only be right to do a follow up blog post after Saturdays peregrine watch at Lichfield Cathedral. For the best part of a year now I’ve thought about planning some sort of event celebrating these wonderful birds, my favourite bird, which are calling my local city centre their home. After a lot of umming and ahhing, and a few failed attempts of trying to contact people, I finally brought it all together. Someone I asked for advice on how to get it going was a local person, Kate Gomez, who basically just told me to just go ahead and do it! And I’m really glad I did. My initial thought on why to do it was after watching the birds at the cathedral for the first time last year, and it occurred to me about those that don’t know these birds are here. Just ordinary people walking past the cathedral or through the town and have little idea that these fantastic birds are soaring right over their heads. The worlds fastest animal somehow intertwined into our day to day lives, the least we can do is simply appreciate this! By 10 o’clock there was a good gathering of about ten to twenty people gazing up onto the cathedral desperately scanning for a bird. Then there one was. The female circling around the base of one of the spires. I let out a sigh of relief but I’m not sure why because I knew these fantastic birds would perform and inspire anyone who came along. As the hour went on, numbers increased until at one point there must have been about forty people spread along The Close with their eyes fixed on the cathedral. Not only this but they were sharing small anecdotes about the pair. This included whether or not they’d seen them before, knew they were here, or wondered what the strange noise was which echoed across the town! Some were there with lenses as long as my arm getting simply amazing shots, others had their expensive binoculars, others didn’t, and some came who were complete amateurs and wanted to see what it was all about. Also, with us standing in such a public place we had a lot of passers-by and tourists asking what we were looking at. An American tourist I spoke to was fascinated and could not believe his eyes when he watched the male bird fly over. Everyone’s reactions were very positive, a part from the few who were a bit put off about the headless pigeon the male peregrine brought in! One man told me his friend was walking past the other day and half a pigeon nearly fell on his head! A highlight of the morning had to be when the male, who had been gone for almost an hour, flew in with the headless pigeon. He squawked whilst circling the front of the cathedral a few times then went into the nest. As he did so, we could hear the chicks squabbling inside. It was magical. Numerous people came up to me and said they’d be back as they loved the experience. They’d been mind blown! Over the two hours we estimated 150 people came and went away with some fantastic views. All of these now having a new understanding of these incredible birds and they’ll hopefully pass this on. Who would of thought, this well known three spired Cathedral would be appreciated and enjoyed for its job mimicking a cliff face to provide these city slickers with a place to breed. Keep an eye out for the next watch morning date! A big thank you to The Sound Approach for the scopes too! What a lovely idea to get people interested in these birds. I think people are so disconnected from nature and that’s often why they will stand by and let humans do such awful things to birds and other animals and their habitats. Even getting people to understand a tiny bit more about nature will have an impact – it will enrich their lives and encourage them to stand up for nature. We have them here at Coventry Cathedral as well – in fact on previous years the fledged juveniles have taken to sitting on top of city centre waste paper bins! Well done Georgia, glad it went so well! Well done Georgia! Knew you’d make it a wonderful success. More people will be looking up now instead of unknowingly walking by.Loved your poster too!